Rinse seeds well in colander with warm water to remove stringy pumpkin. Dry on paper towels and lay in a single layer on a cookie sheet to dry overnight for best results. Do not dry on the paper towels or the seeds will stick. Line cookie sheet with foil or parchment paper. We prefer parchment paper. Combine the seasoned salt, Garlic Salt, Worcestershire, melted butter and pumpkin seeds in a bowl. Spread the seeds on a cookie sheet in a single layer. Bake for about 45-60 minutes or until the seeds are light golden brown. Stir the seeds occasionally while baking. 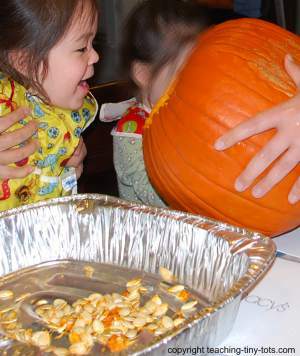 Always make sure that your child is ready to eat pumpkin seeds before giving it to them. You may have to remove the shell for them to try tasting without the harder shell or cook for the full hour to make it "brittle" and easy to eat whole without peeling shell. If using a toaster oven, temperature and time may vary so watch closely. I usually set toaster over about 25 degrees below recipe recommendations. Roasting when seeds have dried overnight will produce better results. Spreading the seeds out in a single layer will also produce better results. If you prefer to crack the shell and only eat the inside, cook for 45 minutes. If you like to eat the entire shell and seed, cook for an hour. If you prefer the seeds to be saltier, boil in salted water for about 20 minutes. We have not tried this yet but have read this will salt the seed inside and not just the outer shell. Basic Recipe Easy for Anyone to Try! We used this one in the classroom in a toaster oven. Rinse seeds well in colander. Dry on paper towels and lay in a single layer on a cookie sheet to dry overnight for best results. Do not dry on paper towels or seeds will stick. Line cookie sheet with foil or parchment paper. Mix the salt, oil and seeds in a bowl.